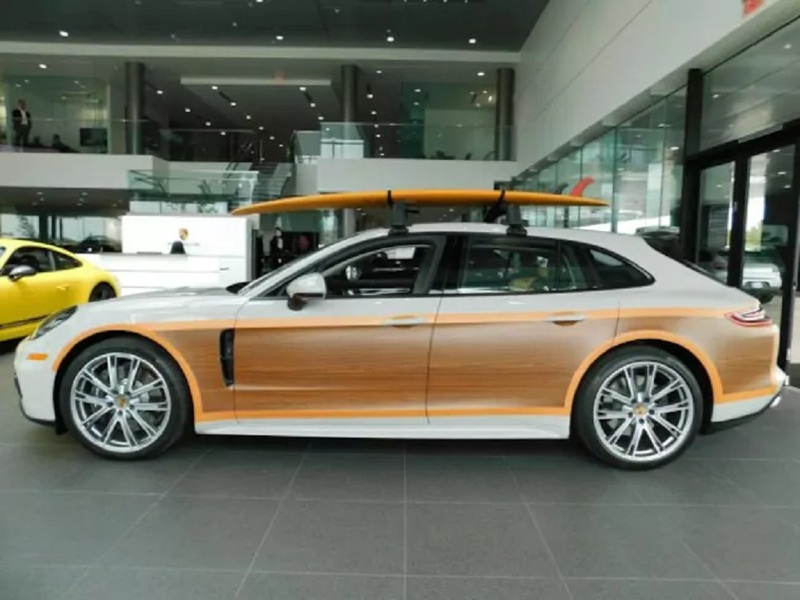 All it takes to completely transform the vibe of Porsche's new five-seater Panamera family truckster is a set of wood veneer vinyl side panels, a roof rack, and a matching surf board. This has gone from a deadly serious German performance longroof to a car that doesn't take itself too seriously, that goes with the flow, that fits in with SoCal surf culture. Currently sitting on the showroom floor of Porsche Irvine, this Panamera Sport Turismo was kitted out with over $17,000 dollars in options, and that's before the aftermarket work was done. Strangely, that option list includes a carbon fiber interior trim pack, but it seems like it would have been more appropriate with wood accented interior, right? After a bit of digging, it appears that this Panamera Sport Turismo was wrapped in rvinyl.com's walnut grain vinyl film, as it appears in photographs among the customer reviews. A vinyl wrap installer with the user name CuR/T of Orange County, CA says he was contracted to turn a modern vehicle into a woody look, and his review states, "it doesn't like to make curves on bumpers and shines up with too much heat. The laminate flaked with too much stretch so we gave up on the bumpers. All in all, the pattern was what we were looking for and it fulfilled that need." It would seem that this design was intended to extend onto the front and rear of the car more than it does, which makes a bit of sense for the look they're aiming for with this project. 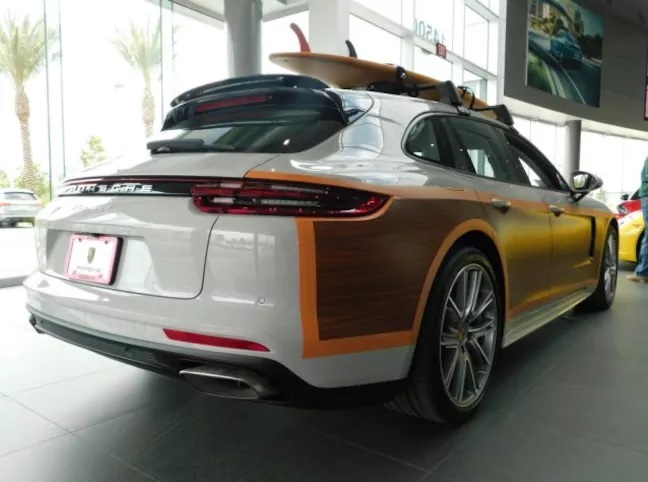 While some treated the idea of a Woodie Porsche as an April fool's kind of idea, the folks at Porsche Irvine decided it actually sounded like a brilliant idea, and had theirs done up old school. 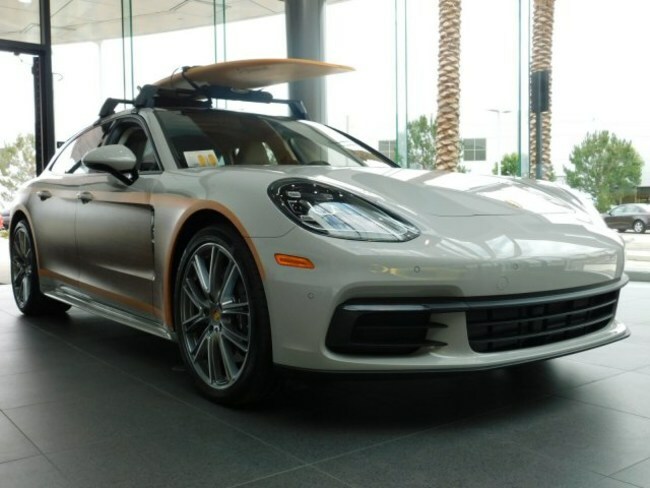 This Panamera is an all-wheel drive base model V6 Sport Turismo, but that doesn't mean it's not up to the task of hustling down to the beach every morning for a surf session. The base color, Chalk, is a gorgeous shade, and it doesn't translate well in photographs. You'll have to check this one out in person. If it sounds like your idea of a great Porsche, it'll cost you $122,340. We hope the surf board is thrown in for that price! Is A Mid-Engine Corvette Enough To Tempt You Away From Porsche? Y G B S M After I finally got rid of my 1959 Ford Country Squire for pennies on the dollar because the guys at Cars & Coffee were laughing behind my back. It is a cruel world, indeed.